The back panel I think is just about done now and ready to be mounted to the desk. 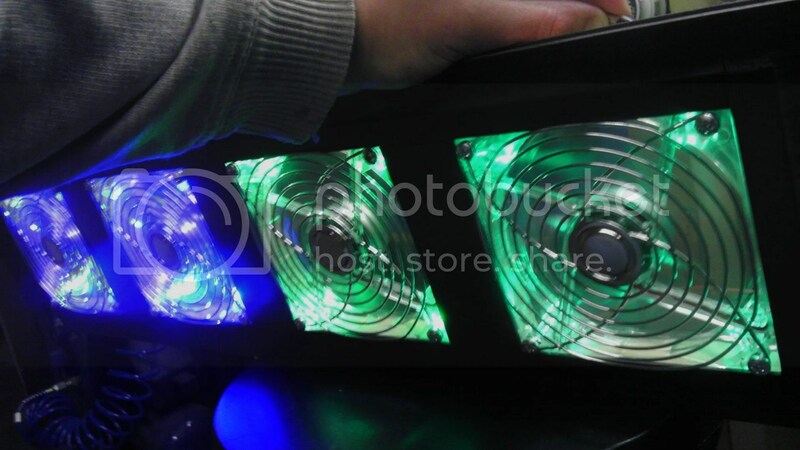 I got 4 new green LED’s and wired them up to the back of the fan so now I have a fully functional, fully lit fan board. All that’s left to do is wire it up to the on/off switch from the control box when that get’s ready and it’s done. However, I am thinking now that I’ve seen a few on eBay for cheap is to get a digital thermal/fan controller that I can mount into the control box as well to see what’s going on temp wise inside the desk. I could also have them set to automatically kick on when it gets to a certain temp and by the looks of it, it would be pretty easy to do! Something to think about anyway!